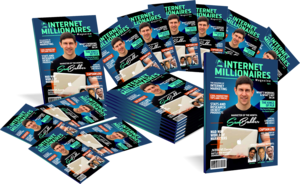 Get Your Own Online MONEY MAKING MAGAZINE Without Doing Any Of The Hard Work! Where Can I Download A Free Sample Of This Magazine for review? The links for buy not work, and the price is for 1 month or lifetime for $47? good question, so i'll also ask it too ..
is that a one-time price, or a monthly recurring price ??? what are the OTOs ??? Can we see an extract of the magazine as sample? you can download a free sample now. where is the download for free sample? if i can not give the magazine away to my email list as a monthly bonus, does that mean i need to sell it to my mailing list ? and as the poster above me asked, where can a past example of the magazine be seen? so how can members log in to access the content on your main website? Yes. You cannot give it away for free. The company magazine has to be sold for at least $27 a month subscription. You can of course strip it to the individual articles (you get all articles in word version) and that you can share with your list for free or give away individually as free. But the full magazine itself cannot be given away for free.